The following is an attempt to make the Patlak plot understandable as more than just a mathematical description of data. First the basic math behind the Patlak plot is described, using a simple model. Then the math is commented and interpreted. Finally, generalizations to more complex models are discussed. Given the input function P(t) and the measured ROI signal ROI(t)x and y can be computed for each time point. The slope of the line is the rate of net influx, Ki. In practice, the Patlak plot is only linear after some time, when steady-state conditions apply outside the compartment of reversible uptake. Even for the simple 1TC model discussed above, a bolus injection of tracer will need a short time to be well-mixed within the plasma. For the simple 1TC model, the line’s intercept with the y axis can be interpreted as the blood volume VB (Eq. 8). In more general models, this volume will be a mixture of the blood volume and the reversible volumes but with no simple interpretation of the precise value. Interpretations of x and y are given in the following section. Eq. 2: The net influx happens with speed Ki×P(t), that is, a constant times the concentration of tracer presented to the system through the input function. Eq. 3: The amount of tracer taken up by time t is calculated by integration of the speed. By analogy with a car: The integral over speed corresponds to the distance driven since time zero. Eq. 4: The measured signal comes from the tracer irreversibly taken up, plus a background signal proportional to the input function. Eq. 5: Division by the input function makes the background a constant value. The disadvantage is that the other two terms (x and y) becomes difficult to interpret. That is, after 3 hours the car has driven 230 km, which would have taken 4.6 hours with a constant speed of 50 km/h. Since the car has not driven with constant speed, this “normalized time” of 4.6 hours is not equal to the actual time. x is the hypothetical time it would have taken to irreversibly accumulate this amount of tracer, if the input function had been at the current value from the beginning of the study. x is time normalized for the variations in plasma concentration. For a tracer study with constant infusion, the input function would indeed be constant, and we would obtain x = t. In fact, a tracer study with constant infusion will automatically be linear and therefore not need the Patlak plot. For studies with bolus injection, the plasma concentration (input function) will usually peak and then decrease for most of the study. Such continuous “deceleration” will result in “normalized time” (x) being increasingly higher than real time (t). Eq. 7: Like x is normalized time, the y value is a kind for normalized measured signal. Again, the normalization, division by plasma concentration P(t), can be interpreted as a compensation for the variations in plasma concentration over time. Assuming that signal and input function are measured in the same units (e.g. Bq/mL), y has no unit. y is the measured signal normalized for the variations in plasma concentration, expressed as the unitless value y = (measured signal)/(input function). 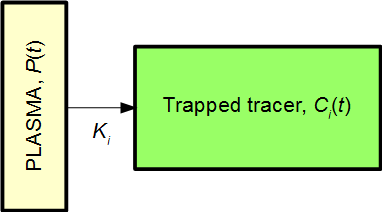 For tracer studies using constant infusion of tracer, the Patlak plot is not needed: When steady-state has been achieved, net influx will have a constant rate = Ki, and signal plotted as a function of time will be a straight line with slope being Ki times the value of the constant input function. Eq 8: For tracers studies with non-constant plasma concentration, e.g. bolus injection, plasma concentration will vary with time. But normalization of both time (as x) and signal (as y) corrects for this variation and results in a straight line with slope Ki = net influx rate. It turns out that the Patlak plot also is useful in far more complex models than the simple model discussed above. The Patlak plot will in then become linear when the reversible compartment is in steady-state equilibrium with the plasma, i.e. when the ratio C1(t) / P(t) becomes stable. When that is the case, the reversible compartment(s) essentially behaves as an extension of the plasma input function, and the irreversible uptake can be described as an effective net influx rate Ki. This can be interpreted as K1 being the primary uptake constant, but of this only the fraction k3/(k2+k3) ends up in the irreversible compartment. For models with several reversible compartments, the Patlak plot will be linear from the time when all reversible compartments are in steady-state equilibrium with the plasma. The slope of the Patlak plot will again be Ki, the effective net influx rate, although the analytic expression for Ki is not necessarily simple to derive. If the Patlak plot is used for a system without irreversible compartment, this corresponds to Ki= 0, and the Patlak plot will become a flat line. Gjedde A. Calculation of cerebral glucose phosphorylation from brain uptake of glucose analogs in vivo: a re-examination. Brain Res. 1982; 257: 237-274. Logan J. Graphical analysis of PET data applied to reversible and irreversible tracers. Nucl Med Biol. 2000; 27: 661-670. Patlak CS, Blasberg RG, Fenstermacher JD. Graphical evaluation of blood-to-brain transfer constants from multiple-time uptake data. J Cereb Blood Flow Metab. 1983; 3: 1-7. Patlak CS, Blasberg RG. Graphical evaluation of blood-to-brain transfer constants from multiple-time uptake data. Generalizations. J Cereb Blood Flow Metab. 1985; 5: 584-590. Rutland MD. A single injection technique for subtraction of blood background in 131-I-hippuran renograms. Br J Radiol. 1979; 52: 134-137.